I love fire, in a non pyromaniac sort of way, whether it be a camp fire on the bank of the Gasconade river, a dancing fire in a fireplace or the gentle controlled burn in a wood stove. When we occupied the “house on the hill” overlooking Truman Lake, I smiled when I caught the scent of woodsmoke curling from the chimney when we returned home in the evenings on a cold Ozark winter night. There is something reassuring about that scent, a promise of warmth, security and the ability to keep the cold night air at bay. Last night, I sat in front of another kind of fire to read, deriving a certain manufactured satisfaction from a perfect burn in front of a gas fireplace at home. It just isn’t the same. I have arrived at the realization that how one perceives a warming fire at home is directly related to how one was raised. I have a brother-in-law, raised with wood heat, who appreciates the old adage that firewood warms you twice, once when you work it up and again as you burn it, a little differently than I do. He talks about trudging through snow and freezing rain to bring in wood and remembers keeping the stove cleaned out and up. The novelty quickly wears off at zero dark thirty when snow is topping your boots as you slip and slide with an arm load of wood. I suspect that I would quickly change my perspective if before we enjoyed a hearty breakfast we first had to bank a fire in a wood stove and “bring it up” to an unregulated temperature to cook that breakfast. My brother-in-law prefers the kind of fire I enjoy here at home where with the flip of a switch, a carefully orchestrated burn, in and around faux logs, springs to life, looking exactly like it did the night before when the same switch extinguished the fire with precision. Admittedly, it beats nothing…..barely. Give me woodsmoke. We were never in any danger of freezing in the house on the hill. We enjoyed central, electric heat courtesy of the efficiency of a heat pump, a pellet stove in the basement and a Jotul wood stove in the great room, located in front of the windows providing a panoramic view of Truman Lake. The Jotul was a cast iron beauty, with a re-burn system to keep the EPA from swooping in and placarding the house. Cast iron stoves get hot, really hot, but are not inclined to creak and crack with the expansion that plagues boiler plate stoves. 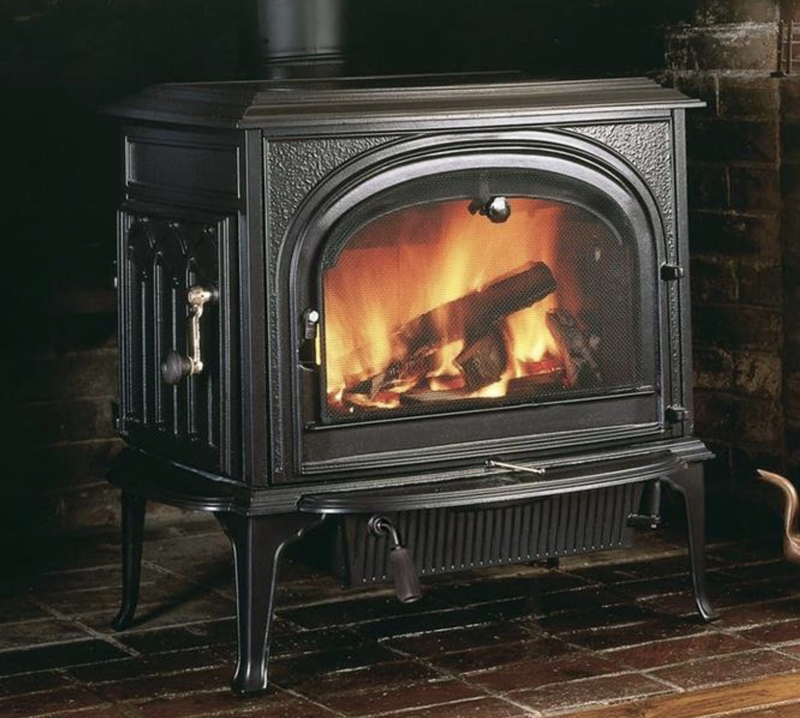 This stove, built in Sweden where they know a lot about burning wood, had a precise damper system, resulting in a burn that could be controlled with nearly the precision of the aforementioned “flip the switch” gas burn. When you opened the door to feed Mr. Jotul, a reassuring puff of woodsmoke greeted you with that familiar and comforting scent that I love. The burn pattern, viewed through the expansive glass door, was never the same from burn to burn, resulting in a mezermizing affect as you watched it dance. A perfect stove has a glass “wash” feature engineered into it’s construction whereby air is cleverly drawn upward and in front of the glass to help preclude the inevitable blackening of the glass. There is another Jotul in my future, necessitating yet another move at some point in our lives. My readers know that among my many vices is an unhealthy appreciation for internal combustion engines. Fortunately, chainsaws are built around small, powerful and efficient little two stroke engines that are wood eating marvels. They are also powerful reminders that mental lapses can result in spectacular results. I have been to the emergency room, courtesy of a lapse when I carelessly touched a still moving chain to my leg. A precise surgical incision was not the result, rather a jagged little mess that prompted the triage nurse to utter one word as I entered. She looked at my leg and, without prompting, flatly stated “chainsaw”. I now wear those funny looking chaps, along with a hard hat, face screen, and hearing protection. A boot full of blood makes a peculiar squishy sound as you walk…….disconcerting is an apt description. This being said, I enjoy working firewood, cutting, bucking and splitting (courtesy of another internal combustion engine on a tow behind log splitter). I can see the promise in a carefully stacked cord of firewood, the result of honest and hard work. Cordwood doesn’t talk, but if it could, I suspect it would tell you that when the snow flies, it will have your back. Later today, Sharon and I will likely adjourn to one of our favorite eateries, the Cracker Barrel, where we will ask for our preferred table, the barrel with the checkerboard on it in front of the fireplace. There isn’t much leg space, but the warmth from the ever present fire makes up for the inconvenience. Something about sitting in front of the fire, in a rocking chair and enjoying a meal cooked home style. It is fun to watch folks stop and turn their backs to the fire, soaking up the warmth as they comment on our table arrangements…….